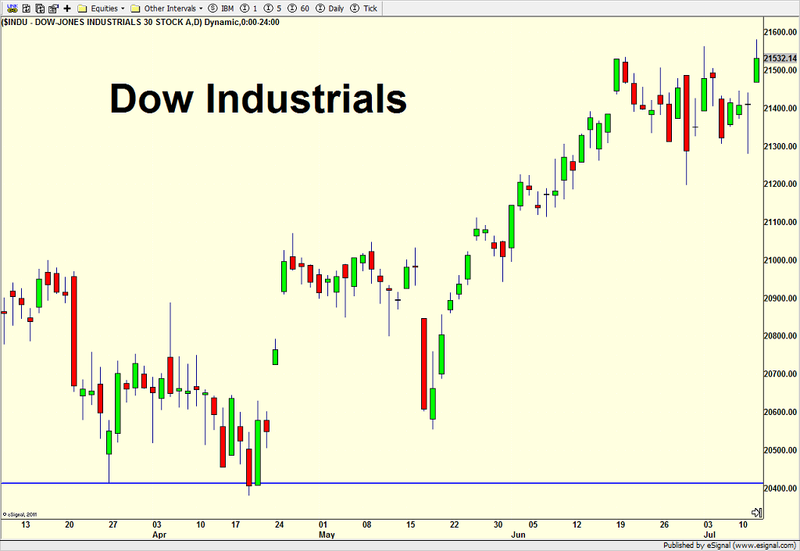 After a number of short-term victories for the bulls over the past week, the Dow Industrials and Dow Transports scored new all-time highs together, triggering a Dow Theory confirmation or buy signal on Wednesday. While the Dow Industrials were the lone major stock market index to see fresh highs so far, I expect the S&P 500 to follow suit shortly. The S&P 400 and Russell 2000 should not be far behind which would add even more credence to my forecast of limited downside. However, I still do not believe that stocks are ready just yet to blast off on another leg higher. As the NASDAQ 100 repairs itself, I think the stock market remains in a trading range which will eventually be fully resolved to the upside. Participation in the rally remains very, very broad and strong no matter what you hear differently from the pundits. These are the same pundits who were negative after BREXIT and the election last year and continue to scream about a major decline or bear market starting. The chart below says it all. The NYSE A/D Line is once again at all-time highs. While it’s not 100% perfect, this indicator rarely looks so strong as a bull market is ending. When I say “rarely”, I believe it has only failed once in the modern era. In any case, with high yield bonds stepping up again and the other evidence I continue to point out, buying weakness is the correct strategy until proven otherwise. After staving off early morning selling on Tuesday, the bulls followed through with a nice little day on Wednesday. As I have discussed, the NASDAQ 100 continues to bounce back and resume leadership. That’s an intermediate-term positive, especially if the index does not lead on the downside during the next pullback. 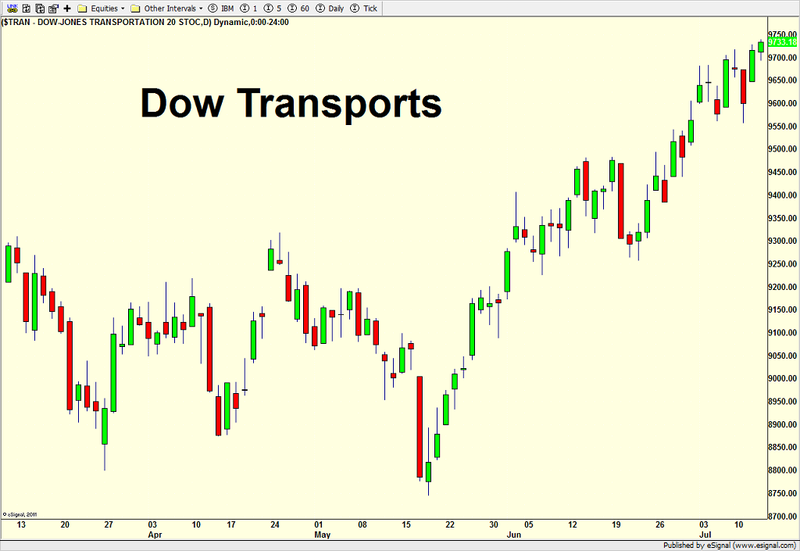 While the Dow was the only major index to score an all-time high on Wednesday, the Dow Theory crowd will point to the transports also hitting an all-time high. That’s considered a Dow Theory confirmation and portends higher prices ahead. In that regard, the bull market is alive and well. Besides the good sector leadership, high yield bonds also seem to have ended their pullback. While they are not yet at new highs, their behavior is constructive. For the past month or so, I have focused much of my commentary on the NASDAQ 100 as it had been the far and away market leader before getting hit with the ugly stick from late May to early July. Late last week, things began to change and I saw the NASDAQ 100 looking a little better in the short-term. On Friday, the bulls, especially in tech and the NASDAQ 100 did step up with the anticipated bounce beginning. That’s continuing today and a good sign overall, even though there could be some more weakness ahead. While I still do not see a full scale correction of 10% or anything close just yet, I do think stocks have settled or are settling into a trading range until at least later this quarter. For the nimble, rallies to the upper end of the range can be sold while declines to the lower end can be bought. As this is taking place, it will be important to watch which sectors lead and lag each tradeable move.